Worldwide rare earth elements (REE) demand has continuously been rising for years. For example, total production of neodymium iron boron (NdFeB) magnets was around 10,000 tons in the year 2000 and is expected to reach 120,000 tons by 2020. NdFeB magnets represent about 62 % of all permanent magnets produces worldwide. A gradual increase of energy efficiency classes of electric motors due to the European energy efficiency legislation. A transition of the automotive industry towards electromobility. The further expansion of wind energy. Ever shorter product cycles of optical and acoustic devices of the information-, communication-, and consumer electronics industry, as well as in the automation technology. Germany is comparatively poor in raw materials, nevertheless, it generates a significant share of the gross national product by the manufacturing of specialized industrial products (e.g. automotive, machinery, automation, medical technology) in which REEs are used. Thus, REEs are essential for very different industries and actors. The identification, evaluation and control of social, environmental and economic impact of their own supply chains presents those German companies who source raw magnet suppliers from China with major challenges. In particular, influencing the upstream (from mining to smelters and concentrate producers) and compliance of environmental and social standards at the origin of the supply chain are difficult to realise for individual companies. This is mainly due to the complexity of the supply chain in a constantly changing market. The low leverage of European importers on the upstream, in addition to the environmental risks that have significant impacts on health and safety of the employees, is an emerging issue in sustainable supply chain management. Simultaneously requirements on companies to take responsibility for their supply chains and to document it is constantly growing. On 9 March, 2017, the European Union passed legislation to strengthen non-financial reporting by companies, in order to implement the EU Directive 2014/95. Further information on this topic can be found in a brochure on the German Sustainability Code (DNK). The DKN can be applied worldwide and is useable for organisations and companies of any size and legal structure. FairMagnet would like to meet the abovementioned challenges in a continuous improvement process and achieve partnerships with Chinese raw magnet producers. More information is available here. In addition, global scenarios show a growing demand for REE (mainly neodymium, praseodymium, dysprosium, less terbium) for wind turbines. The demand could rise from about 200 tons in 2010 for this application area up to somewhere between 8,000 tons and 20,000 tons by 2020. Depending on engine-size, powertrains for hybrid, plug-in hybrid and all-electric cars contain between 1 and 2.4 kg permanent magnets per car. Even electric bicycles have a magnet weight of 300 grams (with a Nd content of currently about 30%). A major challenge is to take more responsibility for the processes of upstream. This can only succeed in close cooperation with Chinese institutions and producers. 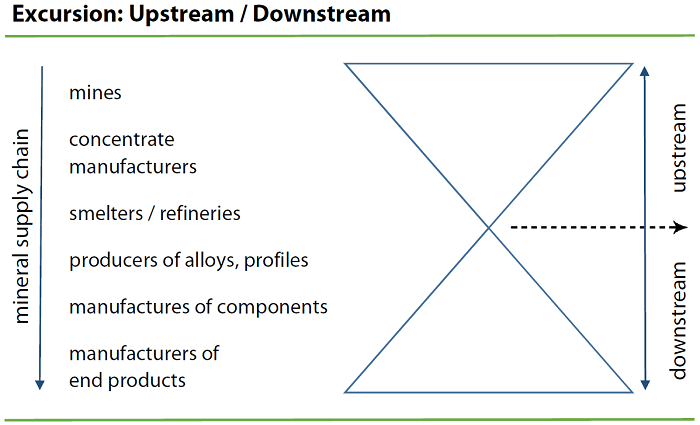 Due to the small number of melts, it is difficult to influence the upstream sector as a single company. That is why FairMagnet bundles the efforts of the individual members. 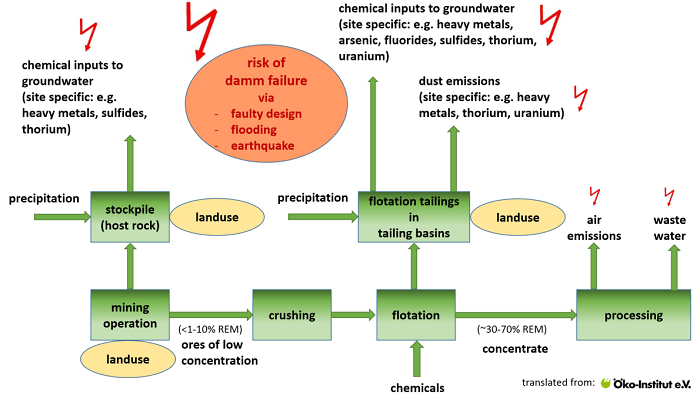 There are many risks in the upstream chain from mining to melting. The University of Nanjing, which FairMagnet actively supports, is in contact with actors of the upstream processes. Thus, the aim for FairMagnet is to represent its members in liaising with Chinese associations and institutions. The environmental risks at the origin of the supply chain are the most significant, but the impact of the European importers at the origin of of the supply chain is admittedly fairly limited. BGR (Bundesanstalt für Geowissenschaften und Rohstoffe) 2014: Vorkommen und Produktion mineralischer Rohstoffe – ein Ländervergleich. 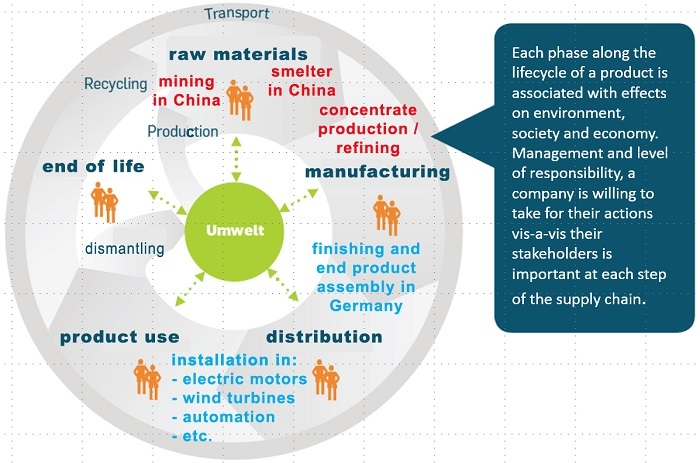 A Sino-German Cooperation to increase environment, health and safety (EHS) in industrial magnet production.